A client of ours asked us to review their resume because he wanted to make sure he didn’t have a resume that made him look like an old fart. Yeah, I would say that’s a worthy goal: Making sure your resume doesn’t make you look like an old fart. You have to realize if you lead with age, the hiring manager is going to think you are old. (2) He used the word “seasoned” to describe his experience in his summary. Only French fries and food should be seasoned... Not senior professionals. Don’t call yourself seasoned. (3) He had two spaces after every sentence ending. Yes, two spaces after the period. This is a 1950’s typing rule. It’s old fashioned. Use it and people will think you are old fashioned... Or wonder why you have two spaces after every period because they are too young to know that was a rule. (4) The body of his resume doesn’t have achievements and only houses job description tasks. This is a 10 year old resume tactic. Today’s resumes have achievements. Recruiters want to know how well you did your job, not just that you completed your tasks. Attend my No-Cost "How to Design a Powerful Resume to Land Six-Figure Interviews and Get the Offer!" masterclass training session on Tues. 4/16 or Thurs. 4/18 at 1: 30 p.m. ET and we'll help you make your old fart resume smell like roses. How to structure your resume, taking into account what kind of information recruiters want to find, and where. 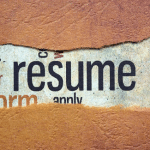 What to replace on your current ineffective resume (and the exact words to use instead). Why recruiters ignore responsibilities and how to communicate RESULTS instead -- almost no one else does this... so those that do go straight to the top of the pile.